These clay skeleton figures represent the elegant and fashionable dead and are inspired by Posada's classic La Calavera Catrina prints. These Catrin and Catrina skeletons are a perfect addition to your Day of the Dead decorations and display. 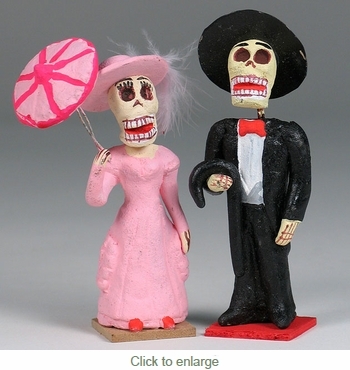 All of our clay skeleton figurines are handcrafted by folk artists in Mexico. Expect variations in color and design.